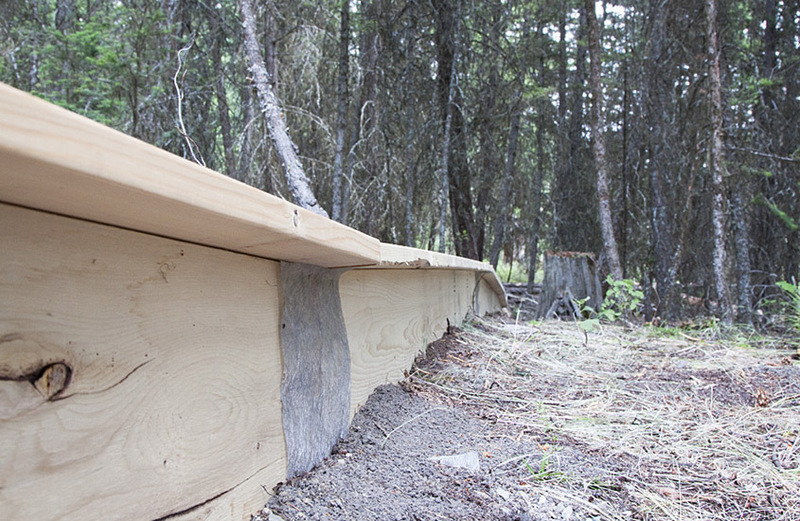 The Nicola Naturalist Society, in collaboration with BC Parks and professional herpetologists from Biolinx Environmental Research, have successfully built a new ‘toadlet fence’ at Kentucky-Alleyne Provincial Park near Merritt. Starting in 2012 we’ve been working on a solution to prevent hundreds of tiny Western Toads from being killed on the campsite road in the park. West Pond in the park is one of the traditional breeding sites for Western Toads, a species of ‘Special Concern’ in Canada. In late July tens of thousands of tiny toadlets, freshly metamorphosed from tadpoles, leave the pond to head into the forest where they spend most of their lives. Their migration route takes them across one of the busiest roads in the park and hundreds were being killed by cars every summer. 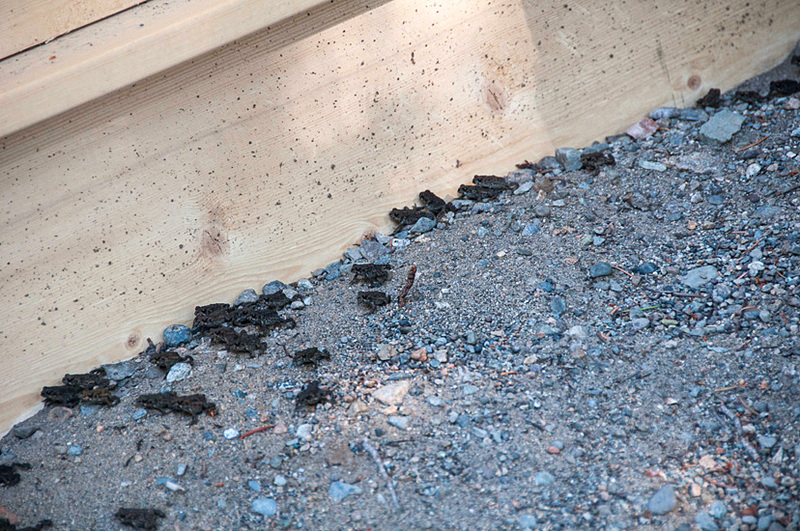 In 2013 BC Parks installed an enviro-culvert to allow the toadlets to cross safely under the road. 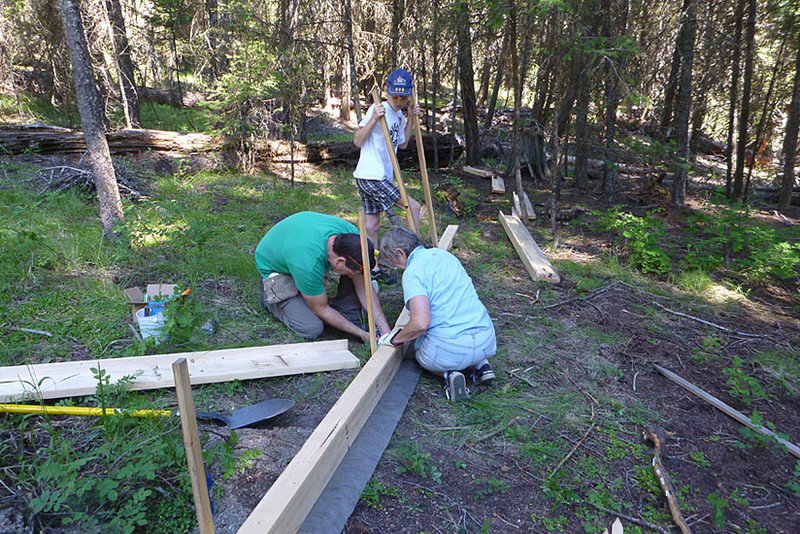 NNS volunteers, directed by the Biolinx professionals, erected a temporary landscape-cloth fence to guide the toadlets under the culvert/tunnel. For more information on the 2013 project click here: 2013 Kentucky-Alleyne report. This year we installed a permanent and longer funnel fence. Our new fence is made of wood (2×8 boards with a 1×4 lip and a landscape-cloth skirt along the bottom) and should last many years. 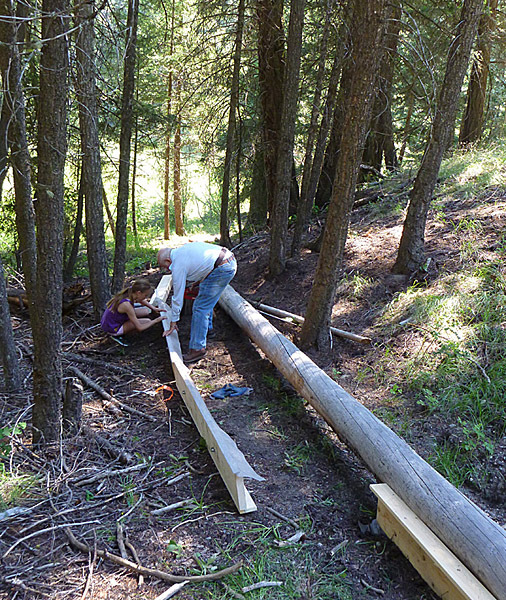 BC Parks provided the funding for materials and our club provided the volunteer hours to build the fence, install it and monitor how well it worked. 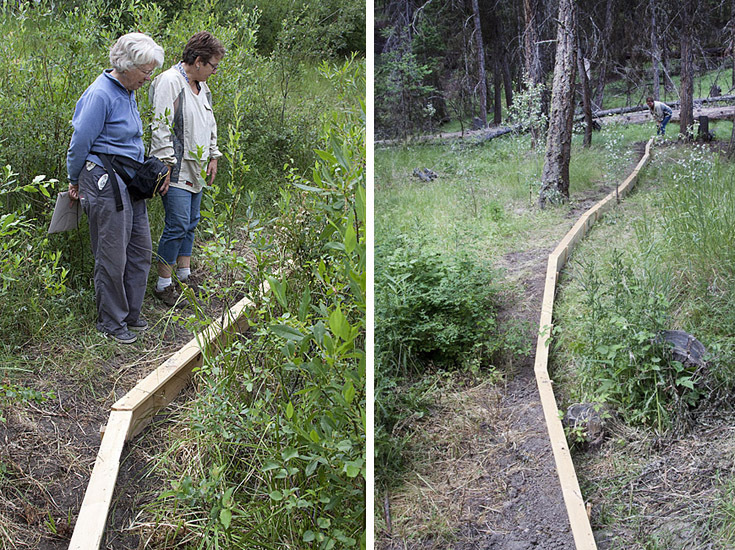 On 10 July 2014 we had a work party at the park and had a great turnout of NNS members – young and old. By 4 PM we had it done. But – would it work? By 17 July there were already hundreds of toadlets massing along the shores of West Pond. We had some anxious days when it seemed they were all going to head into the forest on the north side of the pond – the opposite side to where they had traveled in past years and where we had the funnel. But tradition prevailed and the toadlets swarmed along the shore and started heading out of the south side of the pond – towards our new fence. Over the next 20 days we monitored their movements, counting the numbers going through under the tunnel and also those that missed the tunnel and did cross the road. Volunteers camped in the park so they could do early morning and sunset surveys. Many of the thousands of toadlets that left the pond did indeed go through the tunnel to reach the forest beyond. 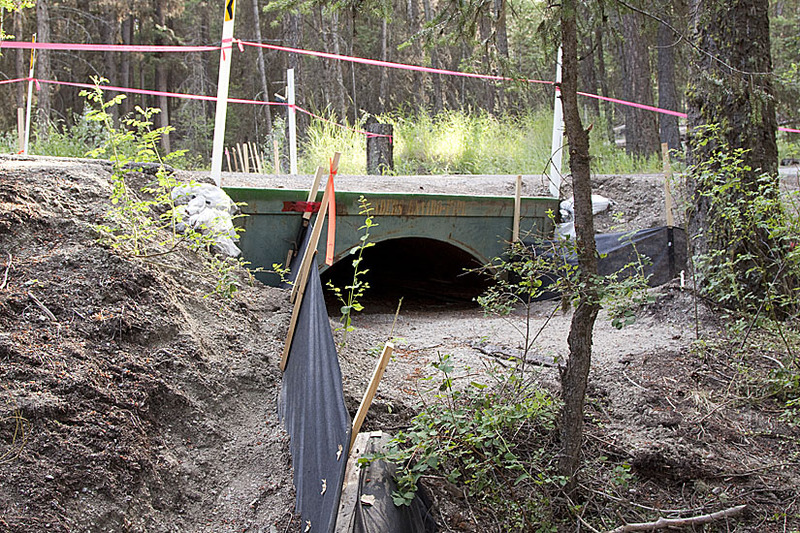 BC Highways loaned us a remote camera which we mounted above the tunnel entrance. The camera took a photo every 15 minutes around the clock, so we could know when the peak migration occurred. 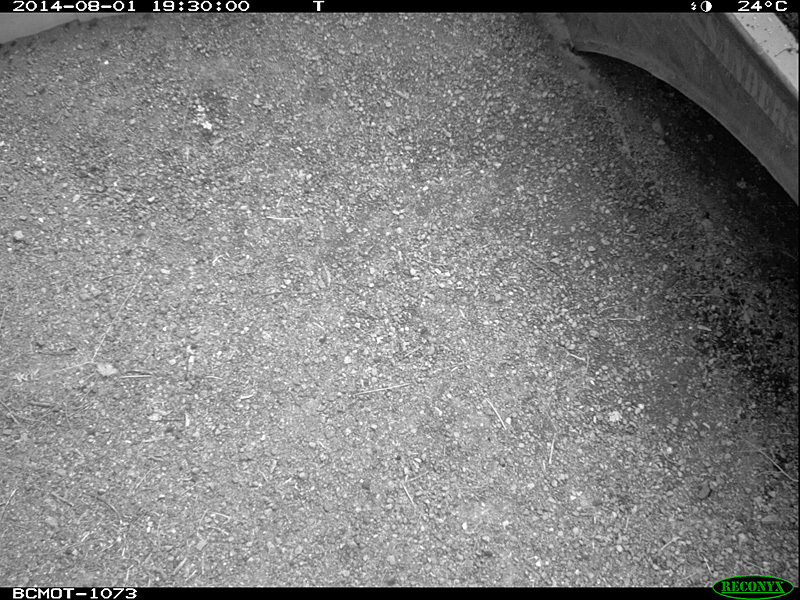 Its hard to pick out the little toadlets in these remote photos, and we are still working on counting them all. 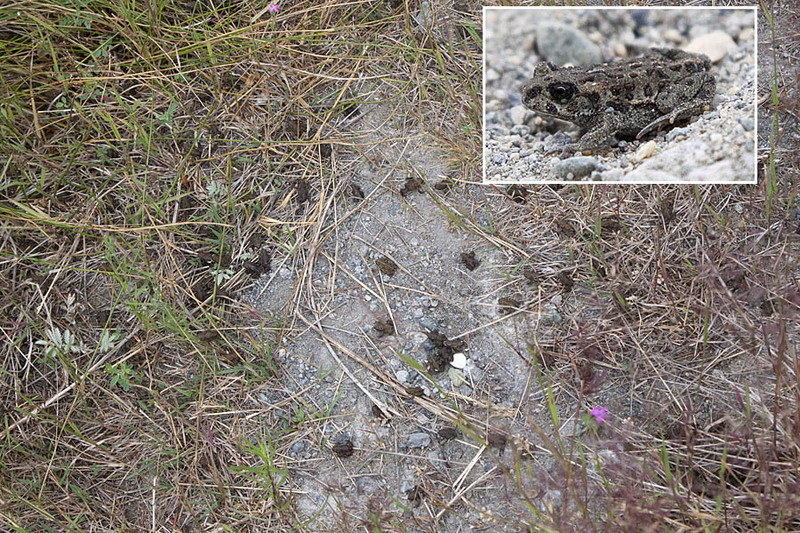 Flicking back and forth between successive photos is the best method to pick out the moving toadlets. 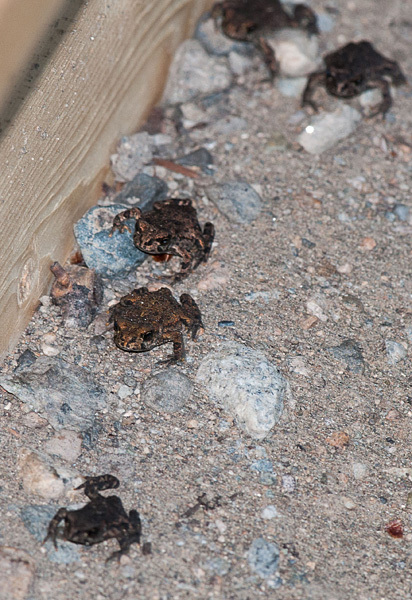 Photo taken by the remote camera at 7:30 PM on 1 August 2014 – the day many toadlets passed under the tunnel. See any toadlets? Check the next photo to see how many there are. The yellow circles show the toadlets. The analysis of the 2014 data is still being done. We will post a report here later. Thanks to all the volunteer effort, many hundreds of toadlets avoided being killed on the road. Roadkill is a serious problem for amphibians in many areas around the world. People in other areas where Western Toads and other amphibians are killed on roads are interested in our work and might install similar toadlet tunnels and funnel-fences.